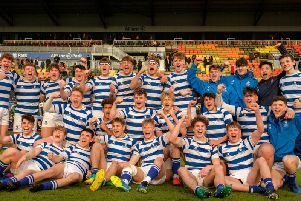 Warwick School youngster Jamie Shillcock became the youngest player to appear in a Greene King IPA Championship play-off match when he came off the bench to help Worcester Warriors defeat London Scottish in last Friday’s semi-final. The 17-year-old was given a run-out for five minutes at the end of the match as Warriors recorded a comfortable 38-15 win at Sixways. Shillcock said: “Getting the call-up to play for Warriors and to be involved in the match is something I will always remember and I’m incredibly grateful to the coaches for giving me the opportunity. Warriors turned to Shillcock when they lost scrum-half duo Charlie Mulchrone and Jonny Arr to injury and suspension respectively. Shillcock was given the news of his call-up from Warwick School director of rugby Mark Nasey during a school lesson before the youngster made his way to Sixways to link-up with his teammates. After just three days of preparation, he was lining up in the matchday squad alongside Wales international Jonathan Thomas, Australia international Cooper Vuna and Aviva Premiership winner GJ van Velze. And the youngster admits some wise words from England full-back Chris Pennell helped settle his nerves before he was introduced to the action. With JB Bruzulier the only available first-team scrum-half, Shillcock is likely to be involved in the play-off finals against Bristol this month. And he admits he is focused on making the most of his opportunity. Shillcock added: “I’m really excited about the next few weeks and I really hope I can be part of a squad which can win promotion to the Premiership.